This simple make ahead recipe for sausage-filled biscuits freezes very well; just reheat for a quick breakfast. You can reheat them straight from the freezer. Just put the little biscuits on a cookie sheet and brush with some milk. Bake at 350F for about 10-20 minutes or until they are hot. Serve immediately. You can also reheat them on 50% power in the microwave oven, or try the toaster oven. You can use a commercial baking mix for this recipe, or make your own homemade Bis-Quick Baking Mix. That way you can control the sodium and omit preservatives from your recipes. The mix is simple to make and stores well in a tightly closed container at room temperature. Just measure it as you would flour and use in recipes. There is no fat like butter or shortening in this recipe because the sausage provides the fat. Don't use lean sausage, or turkey or chicken sausage in this recipe because the biscuits will be dry. You can use your favorite cheese in this recipe too. Gruyere, Swiss, Havarti, or Monterey Jack would be good or try some grated Parmesan. A combination of cheeses would also work well. For a bit of a kick, try using Pepper Jack cheese. 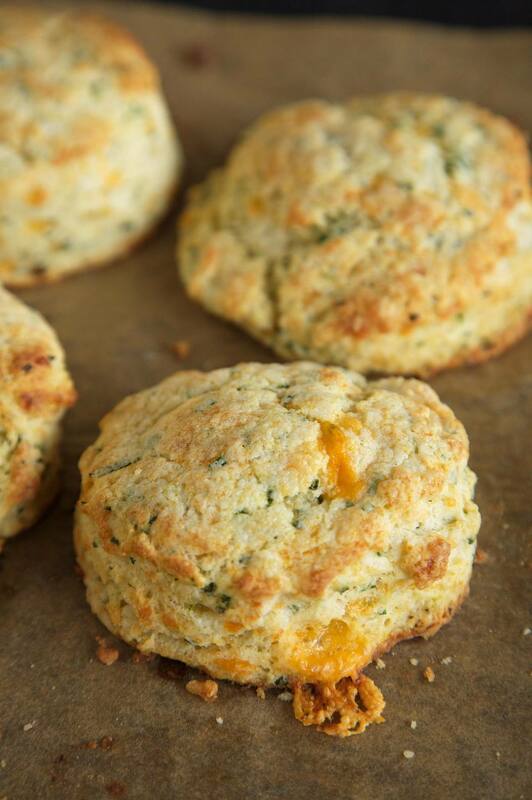 Serve these biscuits with gravy, or eat them on the run as you leave for work or school. All you need is an apple or an orange along with some coffee in a travel mug and you're set for the morning. In a large skillet, break up sausage and cook over medium heat until thoroughly cooked. Do not drain. In a large bowl, combine baking mix, cheese, and chives and stir to combine. Add sausage along with the fat in the pan and mix until well distributed. In a small bowl, beat together egg, milk and salt, and pepper. Add to baking mix mixture and blend until mixture forms a ball. Don't overwork the dough. Shape the dough into 24 balls, using about 1 tablespoon of dough for each. Place the little balls on an ungreased baking sheet and bake at 350F for 20-25 minutes until browned and cooked through. Serve immediately or freeze. Any leftovers should be stored in the refrigerator because they contain meat. Reheat refrigerated or frozen biscuits in the microwave or oven at 350°F until hot.